We were in Chicago for the weekend for a friend’s wedding. 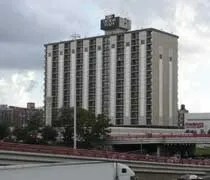 Our hotel was the Crowne Plaza Metro in Greektown. On Sunday morning after a night of drinking, we decided to meet up with some friends from Ohio that we don’t get to see often and have lunch before we went our separate ways. The night before, I went for a walk to kill time and check out the restaurants in Greektown. We checked out of our hotel then walked down Halsted. 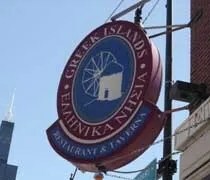 I had read a little about a restaurant on the corner of Halsted and Adams called Greek Islands. 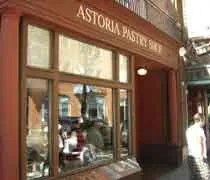 The Astoria Pastry Shop was another recommendation from fellow blogger Genie28. Being new to the area, we had no idea that Greektown was pretty much within walking distance from Comerica Park which was our final destination of the night. We drove down Monroe Street looking for the shop. After driving around the cramped streets for a few minutes, we realized how close we were to CoPa and ended up pulling into a lot and just parking for the night. We headed back to Monroe Street to find the Astoria Pastry Company and couldn’t believe what we found.